Forget tortilla chips — use Corn Flakes. Easy-peezy! Brown ground beef, drain. Return to skillet and add contents of one envelope of taco seasoning mix and 3/4 cup water. Simmer for 10 minutes. Heat refried beans. Cover bottom of a casserole dish with Corn Flakes. Gently spread dollops of refried beans over the corn flakes. Top with ground beef mixture. Sprinkle with a bit of cheese and a few flakes. 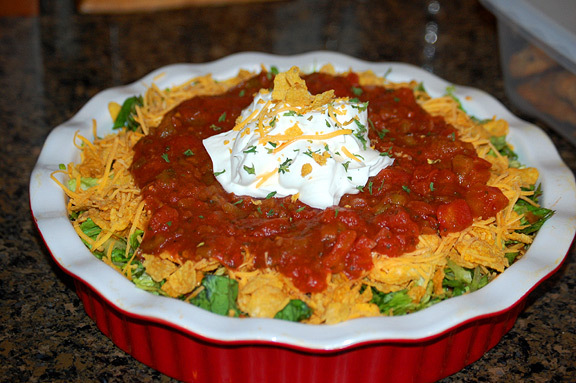 I love this recipe- the corn flakes add the crunch but keep it light!! Are you practicing for Iron Chef! No, but I guess it’s time to think of some new recipes, isn’t it!